Discusses the future of CAD design and shared insight as to what makes IronCAD unique. 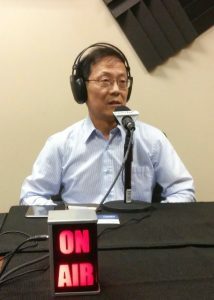 ATLANTA, GA. October 25, 2016 – IronCAD, LLC, the leading provider of design productivity solutions, today announced that IronCAD’s president and CEO, Dr. Tao-Yang Han recently appeared on Radio X’s Silver Lining in the Cloud. An open forum show that highlights Atlanta’s top businesses. During the interview Dr. Han discussed where IronCAD’s design collaboration solutions best fit the manufacturing marketplace. There was also discussion regarding the future of the manufacturing industry including the accelerated growth of 3D printing and IronCAD’s vision for further collaboration between customers and manufacturers. Also discussed was how IronCAD’s solutions are the best fit allowing interactivity all areas of the design process including manufacturing, sales, marketing and custom solutions in a secure environment. You can listen to the entire interview by following this link. Presented by Computer Design and Integration, Silver Lining in the Cloud is an open forum show that highlights and promotes many of Atlanta’s top businesses and business leaders. The show airs on Wednesdays at 10:00am EST and is co-hosted by Nikole Smith-Toptas and Dominick Rainey. Silver Lining in the Cloud highlights and promotes many of the Southeast’s outstanding businesses. We interview C-level individuals and influencers to learn about what makes them the best at what they do. Many of our discussions are with guests from the insurance, financial, manufacturing, medical and educational industries. Our guests will hone in on what is the silver lining that their business offers to the community, how they are making a difference and celebrating their success.